A Jewish Wedding in Brown and Green: Part 1! I had the honor of decorating for the wedding of a fabulous couple of friends this past weekend. Their vision was simple: incorporate their chosen colors green and brown (their invites had an owl and a tree so this was a sub-theme) and have centerpieces that served some function beyond just the wedding. And of course keep within budget. Other than that, I was free to exercise my creative muscles. After discussing centerpieces, we decided to do something living so that people could take them home to enjoy after the wedding. 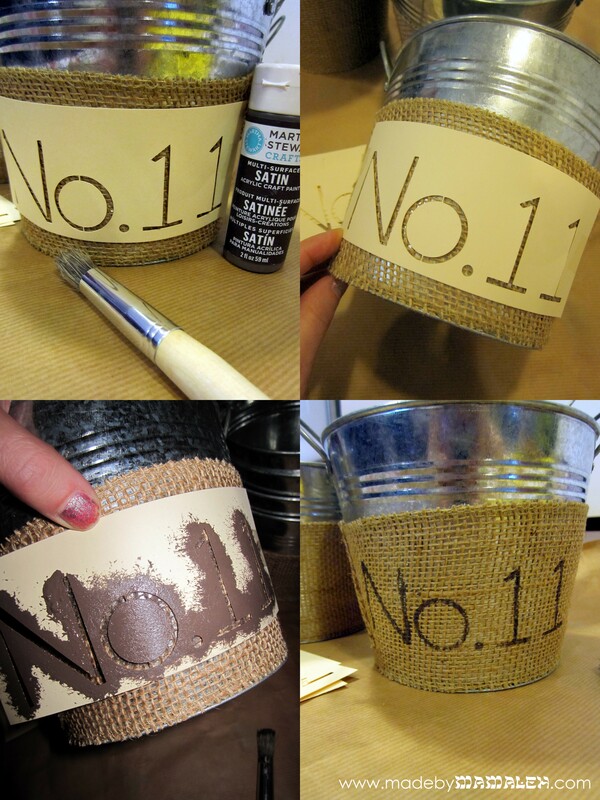 After considering all of the possible vessels for a living centerpiece (terra-cotta pots, etc), I saw these burlap-covered buckets at the local City People’s Mercantile and was inspired to incorporate table numbers into the centerpieces themselves and give it a sort of french country flare so that when put to use later, they just look like cool vintage numbered pots and not table numbers. 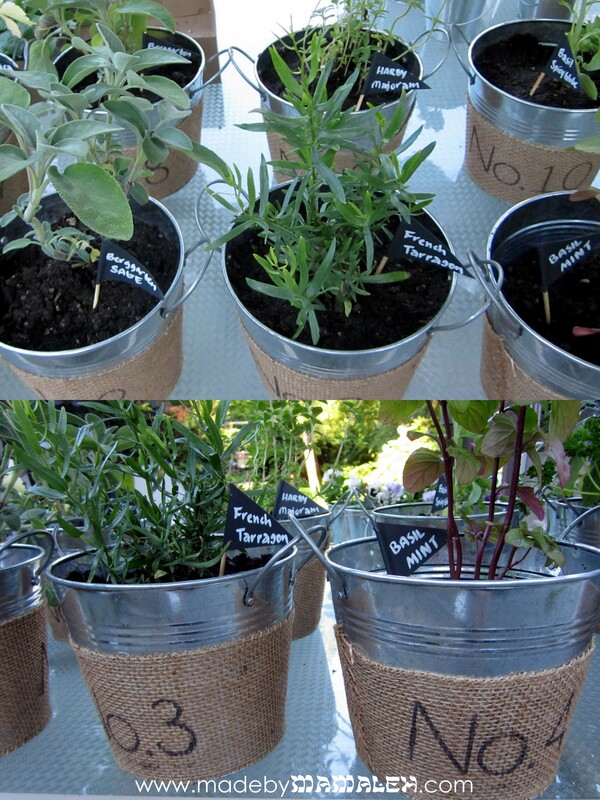 In order to achieve my own version of these, I started with plain 5 1/2″ tall galvanized buckets from SaveOnCrafts. I should note that I looked everywhere to find some that were just the right height for centerpieces at a good price since I needed to make 13 of them and this was the best I found. Ikea does have some buckets that would work but the size was off. 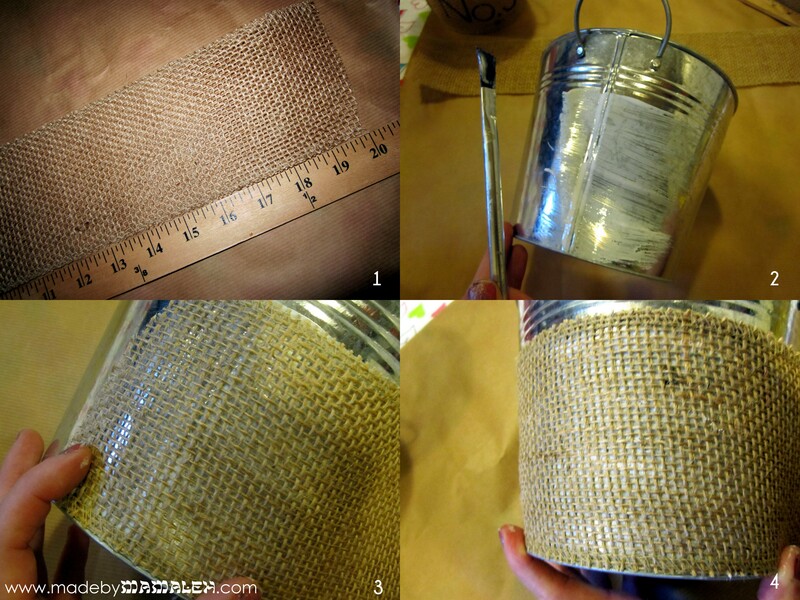 I also searched high and low for wide burlap ribbon and managed to find some 4″ burlap ribbon at SaveOnCrafts as well. 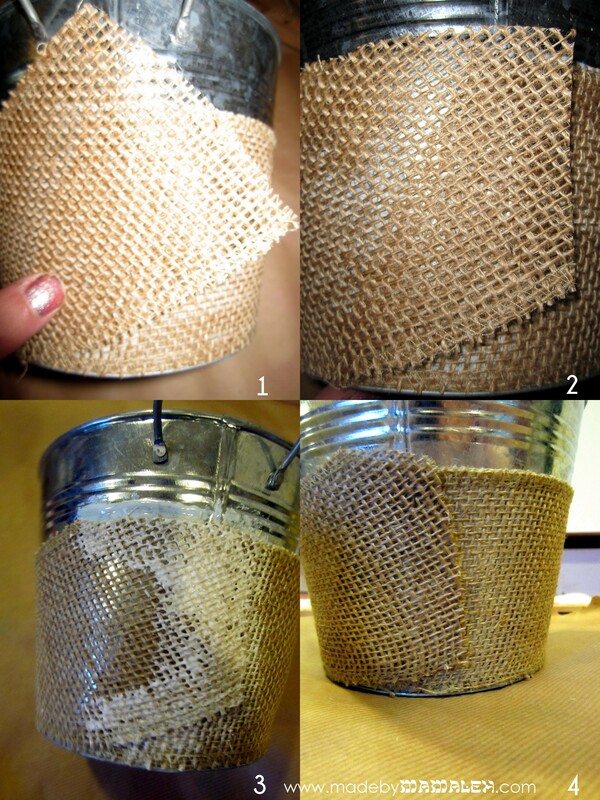 My first attempt to attach the ribbon to the buckets using adhesive dots was a no go, in part because of the angle of the buckets and in part because of the weight of the burlap. So, I decided to break out the Mod Podge! First I figured out what length of ribbon I needed and measured out 20″ strips for each centerpiece. Then, working on one bucket at a time, I painted on the Mod Podge starting at the seam of the bucket. I carefully placed the ribbon down, aligning it with bottom rim of the bucket as a guide. Then, I slowly worked my way around, painting on more Mod Podge as I went. I didn’t worry about the Mod Podge flowing over the the ribbon at all since it dries clear! The trick comes when you get to the end as you will see your ribbon ends at a funny angle (see #1 below). Just cut the ends to be somewhat even with the band of ribbon and then just slather on the Mod Podge. It’ll look messy (pic #3) but as you can see from the last picture below, it’ll dry and have a nice stiff finish and look like the bucket came that way (plus the ends won’t fray). Once all of the buckets were dry, it was time to stencil! I chose to create stencils using my Silhouette. I initially considered making them out of vinyl but then decided that was a bit silly (ie. wasteful) given how many I had to make so opted for cardstock instead since then I could easily use each stencil twice (each bucket had the number stenciled on each side so 2/bucket). The trick with cardstock is keeping the centers of “o”s and things together so I used the knife tool in Silhouette Studio to create a true stencil. Then, I fit as many numbers (in the same font as the invites: Champagne and Limousines) on a 12×12 sheet and cut them out. 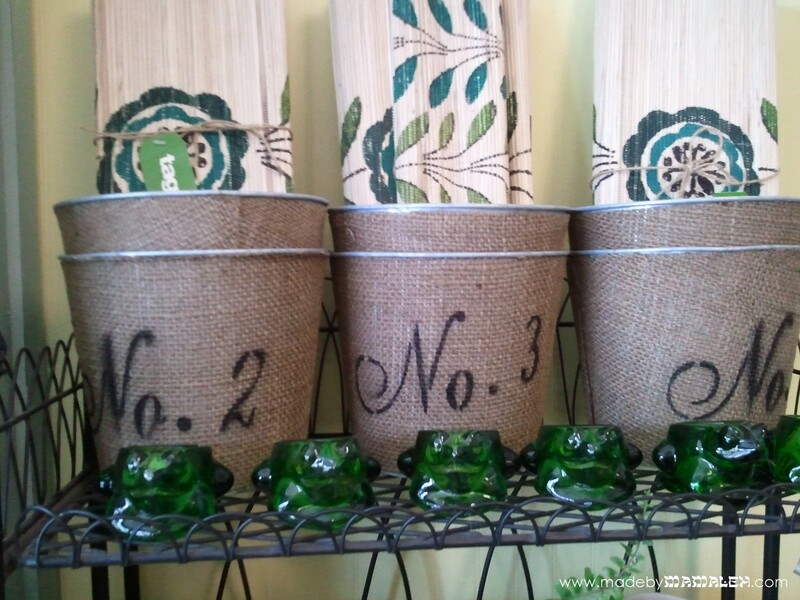 Again, working one bucket at a time, I just used tape on each side of the stencil, stenciled on some Martha Stewart Crafts Paint in Vanilla Bean using a stencil brush. I didn’t worry if the paint bled outside the stencil a little since it just added to the rustic nature of the design. Then came the herbs! Our hope had been to have them all be mint since it’s such a summery herb but alas the first weekend in August, there wasn’t much mint left at the nursery so I decided to go with an assortment of fresh herbs instead (none too pungent of course). After they were all planted in the buckets, I wanted to make sure folks knew what they were taking home at the end of the night and didn’t want to leave the silly little plastic sticks that came with them so I broke out my chalkboard vinyl and cut little flags that I wrapped around short skewers (the vinyl sticks to itself so it was perfect) and then labeled them using a chalkboard pen. I love how they turned out! Totally what the couple wanted – brown, green and reusable – and very summer in Seattle! 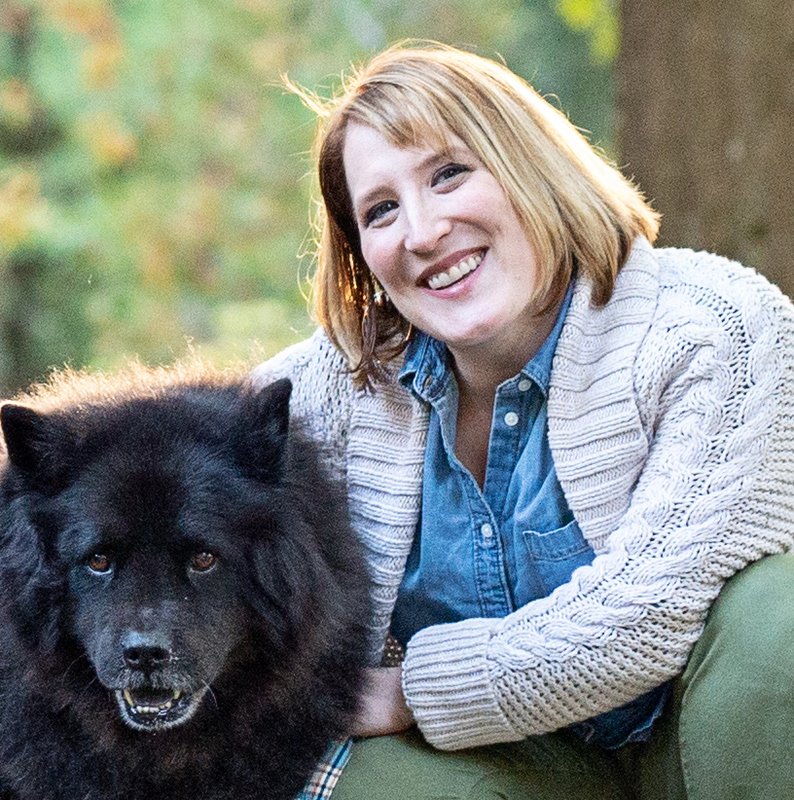 Stay tuned for Part 2 of the wedding – seating cards and a sweet little Jewish accent! 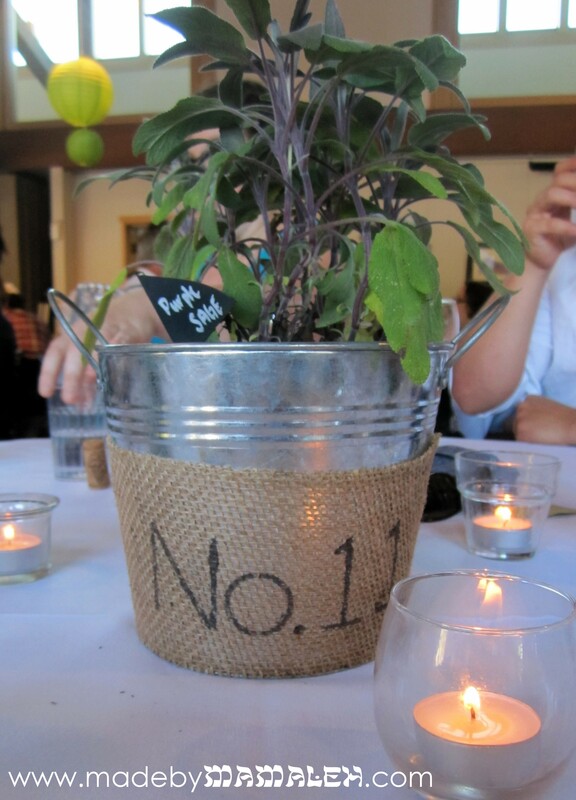 This entry was posted in Crafts, Decor, Vinyl art, Wedding and tagged burlap, centerpieces, chalkboard, fresh herbs, Jewish wedding, stencil, wedding. Bookmark the permalink. These are fantastic! Love how simple and pretty they are!